You know your life has grown pathetic when a passion for Eastern European tennis has you transfixed by a few random results from a lower tier tour event that no one really cares about other than the Betfair folks, a few wildly enthusiastic tennis tour groupies and a promoter who has staked his entire existence on a week’s worth of mediocre matches. Yet such was the situation I found myself in last week as I spent several days searching for scraps of news and compulsively checking results from the Gazprom Hungarian Open in Budapest. The sponsor, a behemoth Russian energy giant not known for transparency, left a bit to be desired, but certainly provided packets full of prize money. My interest had little to do with the top players in the draw. I did not have one measly cent wagered on a match. Instead, I was almost certainly the only one out of 321,400,000 Americans obsessed with the outcome of a handful of matches featuring Hungary’s finest men’s tennis players. These professionals were a motley group of journeymen at best, men whose one shining moment would either be a top 100 or top 1000 ranking. The kind of players who lurk in Davis Cup Group 2 Europe/Africa zone draws, dominating Andorra’s finest before being drubbed in turn by Belarusians. Cheering on Hungary’s finest men’s tennis players is almost always a thankless task. A kind of sporting chore that drove me to distraction for several days with thoughts of epicless efforts by clay court warriors with the names of Attila (of course! ), Marton (very Teutonic with a fierce first service) and Zsombor (sounds like a sibling of Zamfir, that master of the pan flute who I once saw mocked in a Sprite commercial, I think). My hopes and dreams for one week were invested in the results these men might produce. I yearned for a few acts of greatness – such as a first round victory – while preparing for almost certain disappointment. In my zeal for transcendent obscurity, I overlooked a player in the draw with a deep, but less obvious Hungarian connection. I will get to that momentarily, but allow me to first set out a few of the facts surrounding last week’s tournament in Budapest. The Gazprom Hungarian Open was nothing less than a landmark event for the Hungarian Tennis Association. It was the first time an ATP World Tour level event was held in Hungary. What in the name of Balazs Taroczy took so long? Hungary is a nation in love with football, water polo, rowing and handball. Tennis comes in about a ten way tie for last place. To everyone’s surprise Budapest stole a march on Bucharest, sweeping the tournament away from the Romanian capital, where it had been held since 1993. That is what a good or at least a wealthy sponsor can do for an ambitious promoter. Never mind that it was a 250 level tournament, the lowest tier of the ATP World Tour, this was akin to holding a Grand Slam event in Hungary. Wimbledon on the Danube anyone! The Hungarian Open was going to be a big deal, so much so hardly anyone in the world paid attention. Hungarian men’s professional tennis has these disappointments. Being a fan is an exercise in both futility and self-flagellation. Unfortunately only three Hungarian men were entered in singles, two in the qualifying and one in the main draw. This shows the continuing dearth of talent for Hungarian men’s professional tennis players. The results of those entered in the tournament were decidedly mixed. Seventeen year old Zsombor Piros played in his first ever tour level event. Ranked #1397, it is not surprising that he was unable to qualify for the qualifying. Instead, he needed a wild card just to gain entry and then proceeded to lose his first match in straight sets. Attila Balazs did better, winning his first qualifying match in an upset over second seeded and #79 ranked Dusan Lajovic of Serbia, before bowing out in a close match with an American hardly anyone has ever heard of, the exquisitely named Bjorn Frantangelo. 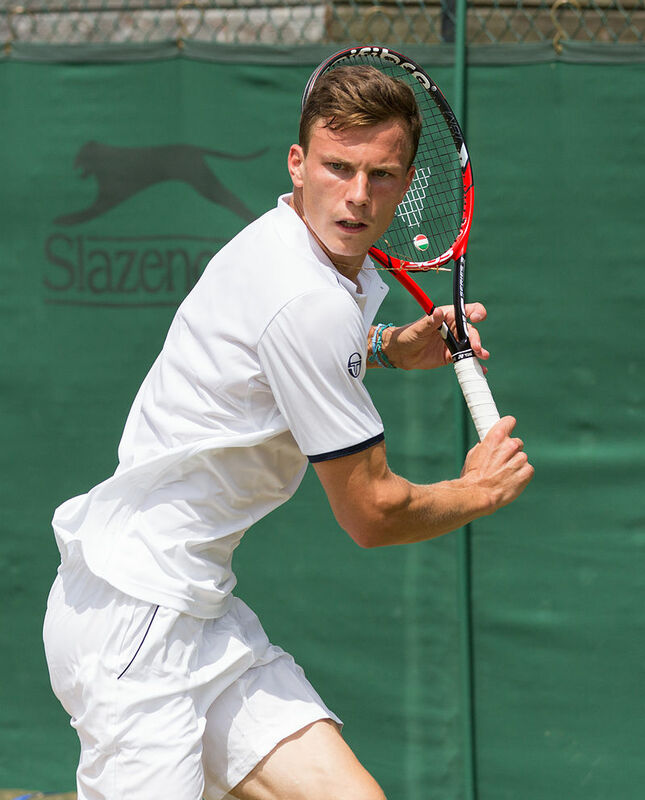 Hungary’s great hope was the nation’s top ranked men’s player, Marton Fucsovics who made the most of his wild card entry by easily defeating Mikhail Youzhny in the first round of the main draw. Fucsovics then lost to a former world top tenner, Spaniard Fernando Verdasco, but not before nearly winning the first set in a tiebreaker. This ended a decent week for the Hungarians, but nothing really remarkable. A great depression started to consume me. I stared at the draw listlessly. All hope was gone. The idea that playing on home turf might inspire the Hungarian men to raise the level of their games was a good one, but the results never really materialized. The truth was they hardly ever do. Yet a ray of light broke through the clouds of defeat. I noticed the name of Laslo Djere, an ethnic Hungarian who happens to be a citizen from next door neighbor Serbia. Djere had the most memorable week of his young career, offering a triumph of hope over experience. A little known fact hidden in plain sight is that the greatest ethnic Hungarian tennis player in history and one of the all-time great women’s players was Monica Seles. Though she started her career playing under the flag of Yugoslavia, Seles grew up in Novi Sad, which is now part of Serbia. The city is located in the Vojvodina region of northern Serbia, home to 250,000 ethnic Hungarians. The Hungarians of Vojvodina were stranded there after the post- World War I Treaty of Trianon severed the region from Hungary and made it part of the Kingdom of Serbs, Croats and Slovenes. Monica Seles’ ancestors were among many ethnic Hungarians who stayed in the area despite their minority status. Few know about Seles’ Hungarian roots. I figured it out because I love to know a lot about nothing in particular, tantalizing myself with trivialities. 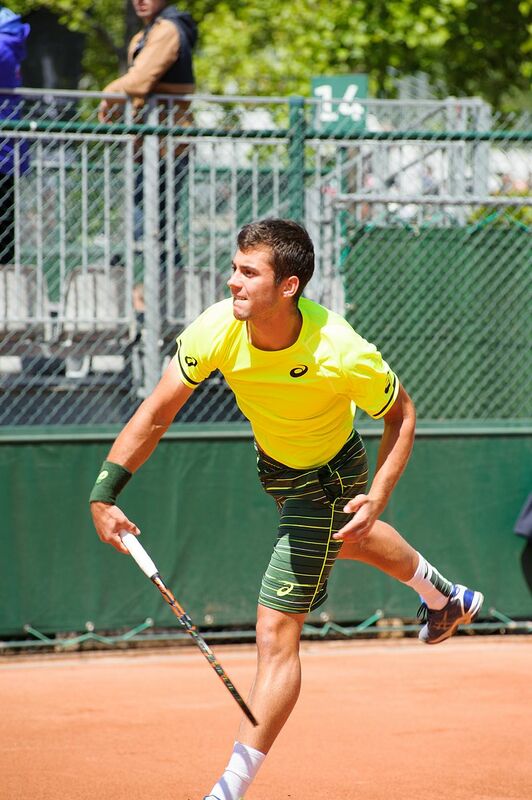 The connection with 21 year old Laslo Djere is obscure, but good enough to keep me engaged in my forlorn hope for some kind of Hungarian tennis greatness. Djere was born in the town of Sentes, whose demographic makeup is 80% ethnic Hungarian. It is the kind of place no one will ever visit, unless they live there. Until March, Djere had shown little promise of making a breakthrough on the World Tour. He had never won a world tour level match and only qualified for the main draw in a handful of events. His greatest feat had been qualifying for the French Open in 2016 before losing in the first round. His record in Challenger events was not exactly raising hopes either. He had managed runner-up finishes at Milan and Cortina in 2016 on red clay, his favorite surface. By April 2017, Djere was ranked #184, but his recent results were some of the worst of his career. He lost in seven straight challenger events, the last five losses of which he failed to win a set. The only reprieve was a one week drop down to the satellite tour where he gained a confidence boost by winning a small event in Croatia. I do not know what boggles the mind more, the minutiae of Djere’s 2017 swoon or the fact that for some unexplained reason he started playing like a top one hundred player in April. Perhaps winning the satellite event helped turn Djere’s game around. Two weeks later he achieved a career first, qualifying for and winning a first round match at the world tour event in Marrakech, Morocco. He nearly made it to the quarterfinals, losing in a taut three set match to Albert Ramos. Then it was on to Budapest where he exceeded all expectations, including my own. Djere barely made it through qualifying by winning two close matches. He then sailed through his first two matches in the main draw. That set him up against Fucsovics’ slayer, Fernando Verdasco in the quarterfinals. The match was played in less than ideal conditions, as rain fell intermittently. This helped Djere, as the slow conditions dented Verdasco’s powerful game. Nonetheless, the Spaniard won the first set and held match point in the second. Down on serve 30-40, 4-5, Djere pulled off a shocker. After saving match point he went on to win the set in a tie-breaker, then handily won the final set 6-2. It was an incredible result, one that I could scarcely fathom. The next best thing to a Hungarian in the semis was an ethnic Hungarian who spoke the language. Though Djere subsequently lost in the semifinals, he had won four main draw matches in Marrakech and Budapest. That is four more ATP World tour level matches than he had ever won on tour before. Djere could have rubbed a rabbit’s foot raw his entire career and not expected to get this lucky. But was it luck or skill? The coming months will likely answer that question. Perhaps I am mistaking a sneeze for a hurricane, but his latest results are nothing short of miraculous. 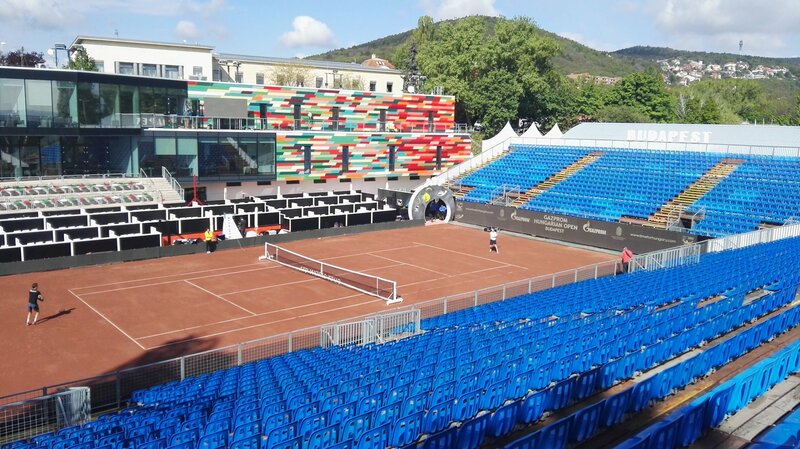 Could Djere, by way of Serbia, be the answer to Hungarian professional tennis fanatics wishes? Does anyone care? I do. This entry was posted in Eastern European Tennis and tagged Attila Balazs, Balázs Taróczy, Davis Cup Group 2 Europe/Africa, Ethnic Hungarian in Serbia, Gazprom Hungarian Open, Hungarian Open Budapest, Hungarian Tennis Association, Laslo Djere, Marton Fucsovics, Monica Seles, Novi Sad Serbia, vojvodina serbia, Zsombor Piros by fortchoteau1. Bookmark the permalink.